In my current company, we implement a state-of-the art banking Fraud Detection system using an Artificial Intelligence running on a Big Data Analytics platform. When working on preventing banking fraud, looking at SWIFT messages is extremely interesting. 98% of all cross-border (international) funds transfers are indeed transferred using the SWIFT Network. The SWIFT network enables financial institutions worldwide to send and receive information about financial transactions in a secure, standardized and reliable environment. Many different kind of information can be transferred between banking institution using the SWIFT network. In this article, I intend to dissect the key SWIFT Messages Types involved in funds transfers, present examples of such messages along with use cases and detail the most essential attributes of these payments. This article presents each and every of these messages, discuss their typical use cases and details key SWIFT fields involved. AI - what do we do differently at NetGuardians ? The world of fraud prevention in banking institutions has always been largely based on rules. Bankers and their engineers were integrating rules engines on the banking information system to prevent or detect most common fraud patterns. And for quite a long time, this was sufficient. But today we are experiencing a change of society, a new industrial revolution. Today, following the first iPhone and the later mobile internet explosion, people are interconnected all the time, everywhere and for all kind of use. This is the digital era and the digitization of means and behaviours forces corporations to transform their business model. As a consequence, banking institutions are going massively online and digital first. Both the bank users and customers have evolved their behaviours with the new means offered by the digital era. How do you want to protect your customer's assets with rules at a time when, for instance, people connect to their swiss ebanking platform from New York to pay for a holiday house rental in Morocco? How would you want to define rules to detect frauds when there are almost as many different behaviours as there are customers? The below is an extract from an interview I ran in February 2019 during the EPFL Forward event. NetGuardians is a Swiss Software Publisher based in Yverdon-les-bains that edits a Big Data Analytics Solution deployed Financial Institution for one key use case: fighting financial crime and preventing banking Fraud. Banking fraud is meant in the broad sense here: both internally and externally. Internal fraud is when employees misappropriate funds under management and external fraud is when cyber-criminals compromise ebanking applications, mobile devices used for payment or credit cards. In the digital age, the means of fraudsters and cyber-criminals have drastically increased. At NetGuardians we deploy an Artificial Intelligence that monitors on a large scale, in depth and in real time all activities of users, employees of the bank, but also those of its customers, to detect anomalies. We prevent bank fraud and fight financial crime by detecting and blocking all suspicious activity in real time. Jérôme Kehrli, how did you manage to convince a sector that is, in essence, very traditional, to trust you with your digital tools to fight against fraud? Two different worlds, two languages, two visions? The situation of the banks is a bit peculiar, the digitization and with it the evolution of the means and the behaviours of the customers in the digital age, was at the same time both a traumatic and a formidable solution. The digital revolution was a traumatic because the banks, which by their very nature are very conservative, especially in Switzerland with our very strong private banking culture, were not prepared for the need to profoundly transform the customer experience of the banking world: to meet the customer where he is, on his channels, with mobile banking, this culture of all and everything immediately, with instant payments, the opening of the information system, with the explosion of the External Asset Managers model and external service providers with the PSD2 European standard, etc. The digital revolution has imposed these changes, sometimes brutally, in banks and it is the source of a tremendous increase of the attack surface of banks. But this same technology that spawned the digital revolution has proved to be the solution too. Technology has made it possible to build digital banking applications that provide all of the bank's services on a mobile device. Technology has made it possible to implement innovative solutions that secure the information system and protect client funds. In the end, if five years ago our solutions seemed somewhat avant-garde, not to say futuristic and sometimes aroused a bit of skepticism, today the banks are aware of the digital urgency and it is the bankers themselves who eagerly seek our solutions. You support the digital shift of the banking sector. Do banks sometimes have to change their way of operating, their habits, to be able to use your technologies? So of course the digital revolution profoundly transforms not only the business model but also the corporate culture, its tools, and so on. At NetGuardians we have a very concrete example. Before the use of Artificial Intelligence, banks protected themselves with rules engines. Hundreds of rules were deployed on the information system to enforce security policies or detect the most obvious violations. The advantage with rules was that a violation was very easy to understand. A violation of a compliance rule reported in a clear and accurate audit report was easy to understand and so was the response. The disadvantage, however, was that the rules were a poor protection against financial crime and that's why fraud has exploded over the decade. Today with artificial intelligence, the level of protection is excellent and without comparison with the era of the rules. But the disadvantage of artificial intelligence is that accurately understanding a decision of the machine is much more difficult. At NetGuardians, we develop with our algorithms a Forensic analysis application that allows bankers to understand the operation of the machine by presenting the context of the decision. This forensic analysis application, which presents the results of our algorithms, is essential and almost as important as our algorithms themselves. This is a powerful application but requires a grip. Tom Cruise in Minority Report who handles a data discovery application playing an orchestra conductor, it's easy in Hollywood, but it's not in reality. In reality, we provide initial training to our users and then regular updates. In the end, a data analysis and forensic application is not Microsoft Word. Our success is to make such an application accessible to everyone, but not without a little help. In conclusion i would say that the culture transformation end the evolution of the tools do require some training and special care. In general, what should a company prepare for, before making a digital shift? In the digital age, many companies must transform their business model or disappear. Some services become obsolete, some new necessities appear. We can mention Uber of course but also NetFlix, Booking, eBookers, etc. For the majority of the industrial base, the digitalization of products and services is an absolute necessity, a question of survival. understanding the scale of the challenge and the necessary transformation. Some say "if it does not hurt, it is not digital transformation"
In summary I would say that a company is "mature" for digitalization if it is inspired by the digitalization of our daily life to adapt its products and services AND if it has the ability to execute its ideas. Ideas without the ability to execute leads to mess, the ability to execute without the ideas leads to the status quo. From there I would say that a company must prepare itself on these two dimensions, bring itself the conditions and resources required to identify and to design its digital products and those required to realize them. The digitalization with its changes of means and behaviours and the induced society and industrial evolution is putting increasingly more pressure on banks. Just as if regulatory pressure and financial crisis weren't enough, banking institutions have realized that they need to transform the way they run their business to attract new customers and retain their existing ones. I detailed already this very topic in a former article on this blog: The Digitalization - Challenge and opportunities for financial institutions. In this regards, Artificial Intelligence provides tremendous opportunities and very interesting initiatives start to emerge in the big banking institutions. In this article I intend to present these three ways along with a few examples and detail what we do at NetGuardians in this regards. This is a collection of three videos I recorded for the "empowerment fundation" as part of their file on Artificial Intelligence. In parallel and in addition to BeCurious, the Empowerment Foundation launches in 2018 a project of curation files thematic through the bee² program. Taking up the practice of curating video content, bee² means: exploring the issues that build our world, expand the perspectives of analysis, stimulate awareness to enable everyone to act in a more enlightened and responsible way facing tomorrow's challenges. It's about bringing out specific issues and allowing everyone to easily discover videos the most relevant, validated by experts, on the given topic without having to browse many sources of information. How does the Google self driving car work ? What are the limits of AI? The three videos can be viewed directly on this very page below. The Lambda Architecture, first proposed by Nathan Marz, attempts to provide a combination of technologies that together provide the characteristics of a web-scale system that satisfies requirements for availability, maintainability, fault-tolerance and low-latency. Quoting Wikipedia: "Lambda architecture is a data-processing architecture designed to handle massive quantities of data by taking advantage of both batch- and stream-processing methods. This approach to architecture attempts to balance latency, throughput, and fault-tolerance by using batch processing to provide comprehensive and accurate views of batch data, while simultaneously using real-time stream processing to provide views of online data. The two view outputs may be joined before presentation. The rise of lambda architecture is correlated with the growth of big data, real-time analytics, and the drive to mitigate the latencies of map-reduce." In my current company - NetGuardians - we detect banking fraud using several techniques, among which real-time scoring of transactions to compute a risk score. The deployment of Lambda Architecture has been a key evolution to help us evolve towards real-time scoring on the large scale. In this article, I intend to present how we do Lambda Architecture in my company using Apache Kafka, ElasticSearch and Apache Spark with its extension Spark-Streaming, and what it brings to us. In this article, I intend to present my company's - NetGuardians - approach when it comes to deploying Artificial Intelligence techniques towards better fraud detection and prevention. This article is inspired from various presentations I gave on the topic in various occasions that synthesize our experience in regards to how these technologies were initially triggering a lot of skepticism and condescension and how it turns our that they are now really mandatory to efficiently prevent fraud in financial institutions, due to the rise of fraud costs, the maturity of cybercriminals and the complexity of attacks. Here financial fraud is considered at the broad scale, both internal fraud, when employees divert funds from their employer and external fraud in all its forms, from sophisticated network penetration schemes to credit card theft. I don't have the pretension to present an absolute or global overview. Instead, I would want to present things from the perspective of NetGuardians, from our own experience in regards to the problems encountered by our customers and the how Artificial Intelligence helped us solve these problems. I am presenting in this video NetGuardians' Big Data approach, technologies and its advantages for the banking institutions willing to deploy big data technologies for Fraud Prevention. The speech is reported in textual form hereafter. Agility in Software Development is a lot of things, a collection of so many different methods. In a recent article I presented the Agile Landscape V3 from Christopher Webb which does a great job in listing these methods and underlying how much Agility is much more than some scrum practices on top of some XP principles. I really like this infographic since I can recover most-if-not-all of the principles and practices from the methods I am following. Recently I figured that I have written on this very blog quite a number of articles related to these very Agile Methods and after so much writing I thought I should assemble these articles in a book. So here it is, The Agile Methods Collection book. So if you already read all these articles, don't download this book. If you didn't so far or want to have a kind of reference on all the methods from the collection illustrated above, you might find this book useful. I hope you'll have as much pleasure reading it than I had writing all these articles. The Bangladesh bank heist - or SWIFT attack - is one of the biggest bank robberies ever, and the most impressive cyber-crime in history. This is the story of a group of less than 20 cyber-criminals, composed by high profile hackers, engineers, financial experts and banking experts who gathered together to hack the worldwide financial system, by attacking an account of the central bank of Bangladesh, a lower middle income nation and one of the world's most densely populated countries, and steal around 81 million US dollars, successfully, after attempting to steal almost a billion US dollars. In early February 2016, authorities of Bangladesh Bank were informed that about 81 million USD was illegally taken out of its account with the Federal Reserve Bank of New York using an inter-bank messaging system known as SWIFT. The money was moved via SWIFT transfer requests, ending up in bank accounts in the Philippines and laundered in the Philippines' casinos during the chinese New-Year holidays. Fortunately, the major part of the billion US dollars they intended to steal could be saved, but 81 million US dollars were successfully stolen and are gone for good. These 81 million US dollars disappeared and haven't been recovered yet. The thieves are unknown, untroubled and safe. The Bangladesh bank heist consisted in hacking the Bangladesh central bank information system to issue fraudulent SWIFT orders to withdraw money from the banking institution. SWIFT is a trusted and closed network that bank use to communicate between themselves around the world. SWIFT is owned by the major banking institutions. In terms of technological and technical mastery, business understanding, financial systems knowledge and timing, this heist was a perfect crime. The execution was brilliant, way beyond any Hollywood scenario. And the bank was actually pretty lucky that that the hackers didn't successfully loot the billion US dollars as they planned, but instead only 81 million. As such, from a purely engineering perspective, studying this case is very exiting. First, I cannot help but admire the skills of the team of thieves team as well as the shape of the attack, and second, it's my job in my current company to design controls and systems preventing such attack from happening against our customers in the future. In this article, I intend to present, explain and decipher as many of the aspects of the Bangladesh bank heist and I know. ELK-MS - ElasticSearch/LogStash/Kibana - Mesos/Spark : a lightweight and efficient alternative to the Hadoop Stack - part III : so why is it cool ? So, finally the conclusion of this serie of three articles, the big conclusion, where I intend to present why this ELK-MS, ElasticSearch/LogStash/Kibana - Mesos/Spark, stack is cool. 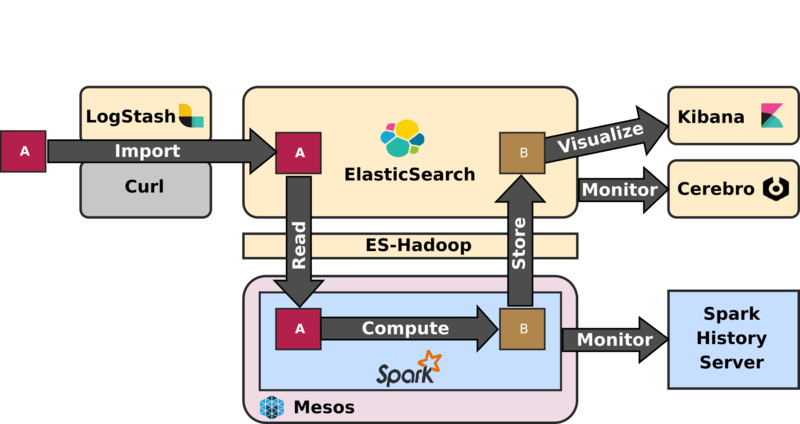 Without any more waiting, let's give the big conclusion right away, using ElasticSearch, Mesos and Spark can really distribute and scale the processing the way we want and very easily scale the processing linearly with the amount of data to process. And this, exactly this and nothing else, is very precisely what we want from a Big Data Processing cluster. At the end of the day, we want a system that books a lot of the resources of the cluster for a job that should process a lot of data and only a small subset of these resources for a job that works on a small subset of data. And this is precisely what one can achieve pretty easily with the ELK-MS stack, in an almost natural and straightforward way. I will present why and how in this article. The first article - ELK-MS - part I : setup the cluster in this serie presents the ELK-MS stack and how to set up a test cluster using the niceideas ELK-MS package. The second article - ELK-MS - part II : assessing behaviour presents a few concerns, assesses the expected behaviour using the niceideas ELK-MS TEST package and discusses challenges and constraints in this ELK-MS environment. This third and last article - ELK-MS - part III : so why is it cool? presents, as indicated, why this ELK-MS stack is really really cool and works great. This article assumes a basic understanding of Big Data / NoSQL technologies in general by the reader. This article is the second article in my serie of two articles presenting the ELK-MS Stack and test cluster. ELK-MS stands for ElasticSearch/LogStash/Kibana - Mesos/Spark. The ELK-MS stack is a simple, lightweight, efficient, low-latency and performing alternative to the Hadoop stack providing state of the art Data Analytics features. ELK-MS is especially interesting for people that don't want to settle down for anything but the best regarding Big Data Analytics functionalities but yet don't want to deploy a full-blend Hadoop distribution, for instance from Cloudera or HortonWorks. Again, I am not saying that Cloudera and HortonWorks' Hadoops distributions are not good. Au contraire, they are awesome and really simplifies the overwhelming burden of configuring and maintaining the set of software components they provide. But there is definitely room for something lighter and simpler in terms of deployment and complexity. The first article - entitled - ELK-MS - part I : setup the cluster in this serie presents the ELK-MS stack and how to set up a test cluster using the niceideas ELK-MS package. This second article - ELK-MS - part II : assessing behaviour presents a few concerns, assesses the expected behaviour using the niceideas ELK-MS TEST package and discusses the challenges and constraints on this ELK-MS environment. The conclusions of this serie of articles are presented in the third and last article - ELK-MS - part III : so why is it cool? which presents, as the name suggests, why this ELK-MS stack is really really cool and works great. In my current company, we implement heavy Data Analytics algorithms and use cases for our customers. Historically, these heavy computations were taking a whole lot of different forms, mostly custom computation scripts in python or else using RDBMS databases to store data and results. A few years ago, we started to hit the limits of what we were able to achieve using traditional architectures and had to move both our storage and processing layers to NoSQL / Big Data technologies. 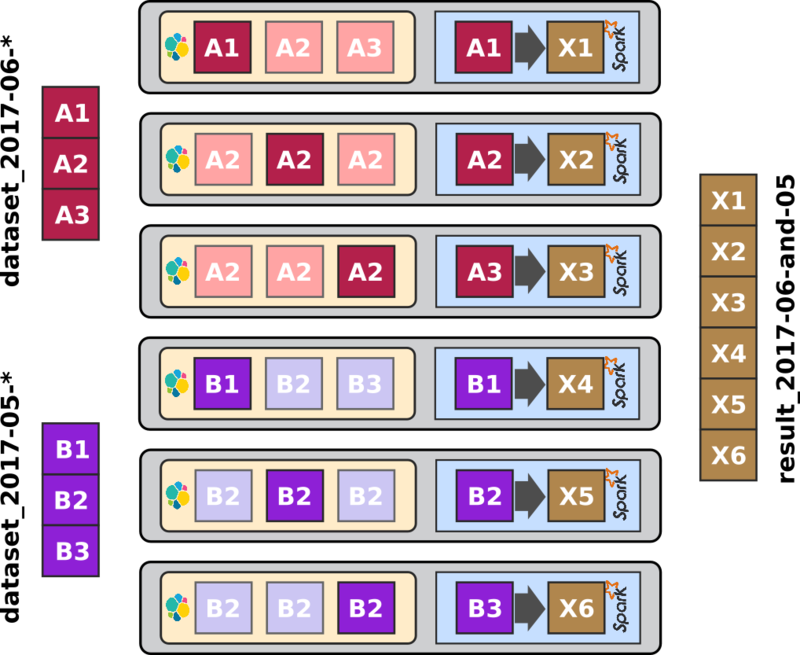 We considered a whole lot of different approaches, but eventually, and contrary to what I expected first, we didn't settle for a standard Hadoop stack. We are using ElasticSearch as key storage backend and Apache Spark as processing backend. Now of course we were initially still considering a Hadoop stack for the single purpose of using YARN as resource management layer for Spark ... until we discovered Apache Mesos. Today this state of the art ELK-MS - for ElasticSearch/Logstash/Kibana - Mesos/Spark stack performs amazingly and I believe it to be a really lightweight, efficient, low latency and performing alternative to a plain old Hadoop Stack. I am writing a serie of two articles to present this stack and why it's cool. This first article - ELK-MS - part I : setup the cluster in this serie presents the ELK-MS stack and how to set up a test cluster using the niceideas ELK-MS package. This article assumes a basic understanding of Hadoop and Big Data / NoSQL technologies in general by the reader. After writing my previous article, I wondered how I could represent on a single schematic all the Agile Principles and Practices from the methods I am following, XP, Scrum, Lean Startup, DevOps and others. I found that the approach I used in in a former schematic - a graph of relationship between practices - is not optimal. It already looks ugly with only a few practices and using the same approach for the whole set of them would make it nothing but a mess. So I had to come up with something else, something better. Recently I fell by chance on the Periodic Table of the Elements... Long time no see... Remembering my physics lessons in University, I always loved that table. I remembered spending hours understanding the layout and admiring the beauty of its natural simplicity. So I had the idea of trying the same layout, not the same approach since both are not comparable, really only the same layout for Agile Principles and Practices. The layout principle is and the description of the principles and practices is explained hereafter. All the work on Agility in the Software Engineering Business in the past 20 years, initiated by Kent Beck, Ward Cunningham and Ron Jeffries, comes from the finding that traditional engineering methodologies apply only poorly to the Software Engineering business. If you think about it, we are building bridges from the early stages of the Roman Empire, three thousand years ago. We are building heavy mechanical machinery for almost three hundred years. But we are really writing software for only fifty years. In addition, designing a bridge or a mechanical machine is a lot more concrete than designing a Software. When an engineering team has to work on the very initial stage of the design of a bridge or mechanical machine, everyone in the team can picture the result in his mind in a few minutes and breaking it down to a set of single Components can be done almost visually in one's mind. A software, on the other hand, is a lot more abstract. This has the consequence that a software is much harder to describe than any other engineering product which leads to many levels of misunderstanding. The waterfall model of Project Management in Software Engineering really originates in the manufacturing and construction industries. Incomplete or moving specification: due to the abstract nature of software, it's impossible for business experts and business analysts to get it right the first time. The tunnel effect: we live in a very fast evolving world and businesses need to adapt all the time. The software delivered after 2 years of heavy development will fulfill (hardly, but let's admit it) the requirements that were true two years ago, not anymore today. Drop of Quality to meet deadlines: An engineering project is always late, always. Things are just a lot worst with software. Heightened tensions between teams: The misunderstanding between teams leads to tensions, and it most of the time turns pretty ugly pretty quick. So again, some 20 years ago, Beck, Cunningham and Jeffries started to formalize some of the practices they were successfully using to address the uncertainties, the overwhelming abstraction and the misunderstandings inherent to software development. They formalized it as the eXtreme Programming methodology. A few years later, the same guys, with some other pretty well known Software Engineers, such as Alistair Cockburn and Martin Fowler, gathered together in a resort in Utah and wrote the Manifesto for Agile Software Development in which they shared the essential principles and practices they were successfully using to address problems with more traditional and heavyweight software development methodologies. Today, Agility is a lot of things and the set of principles of practices in the whole Agile family is very large. Unfortunately, most of them require a lot of experience to be understood and then applied successfully within an organization. Unfortunately, the complexity of embracing a sound Agile Software Development Methodology and the required level of maturity a team has to have to benefit from its advantages is really completely underestimated. I cannot remember the number of times I heard a team pretending it was an Agile team because it was doing a Stand up in the morning and deployed Jenkins to run the unit tests at every commit. But yeah, honestly I cannot blame them. It is actually difficult to understand Agile Principles and Practices when one never suffered from the very drawbacks and problems they are addressing. I myself am not an agilist. Agility is not a passion, neither something that thrills me nor something that I love studying in my free time. Agility is to me simply a necessity. I discovered and applied Agile Principles and practices out of necessity and urgency, to address specific issues and problems I was facing with the way my teams were developing software. The latest problem I focused on was Planning. Waterfall and RUP focus a lot on planning and are often mentioned to be superior to Agile methods when it comes to forecasting and planning. With Agility, it becomes easy to update and adapt Planning and forecasts to always match the evolving reality and the changes in direction and priority. When embracing agility as a whole, the tools put in the hands of Managers and Executive are first much simpler and second more accurate than traditional planning tools. In this article, I intend to present the fundamentals, the roles, the processes, the rituals and the values that I believe a team would need to embrace to achieve success down the line in Agile Software Development Management - Product Management, Team Management and Project Management - with the ultimate goal of making planning and forecasting as simple and efficient as it can be. All of this is a reflection of the tools, principles and practices we have embraced or are introducing in my current company. A blog about Computer Science, Software Engineering and Disruptive Technologies. Below are the most often used tags in the blog. Hover over a tag to see a count of entries, click a tag to see the most recent posts with the tag.